As of 2021, all Infiniti cars will be electrified with the exception of some SUVs. At this year’s Detroit Auto Show, Infiniti lifted the wraps off the , a jaw-droppingly beautiful sedan hinting at the company’s promising future design direction. And yet despite its futuristic looks, its powertrain is decidedly old-school. While most futuristic-looking concept cars tend to be fully electric, the Infiniti Q Concept is powered by a turbocharged, variable compression four-cylinder engine. You would think, then, that Infiniti has a desire to create more driver-focused cars, but instead the automaker is embracing electrification. Infiniti has announced that all new models will be electrified after 2021, with the exception of some large SUVs. Nissan CEO Hiroto Saikawa confirmed its plans to turn Infiniti into an electric luxury carmaker at the Automotive News World Congress, a conference held alongside the Detroit Auto Show. The Japanese automaker says new Infiniti models will be either all-electric or “e-power” hybrids combining an electric battery with a small gasoline engine that charges the battery rather than provide propulsion. Infiniti will introduce its first all-electric car in 2021, two years later than expected. It’s part of Infiniti’s plan to play catch up with the competition. Other luxury automakers like Audi, BMW, Mercedes, Volvo and Jaguar have already outlined similar electrification plans. 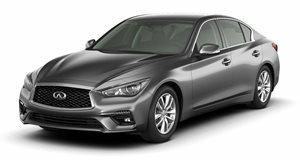 Saikawa also predicts that fully-electric and hybrid models will make up 50 percent of Infiniti’s sales by 2025. While no explanation has been given for the switch to electrification, Infiniti designer Karim Habib told that the proportions of the Q Inspiration could be turned into a fully electric model. “What I love the most is what I can do to interior design,” he said when highlighting the freedom electric car design allows. “By having a flat floor, you have eliminated an object [the driveshaft] just like that. It changes everything," he said. Infiniti’s move to electrification shouldn’t come as a complete surprise however, as the automaker revealed the last year featuring an all-electric powertrain taken from the new Nissan Leaf.